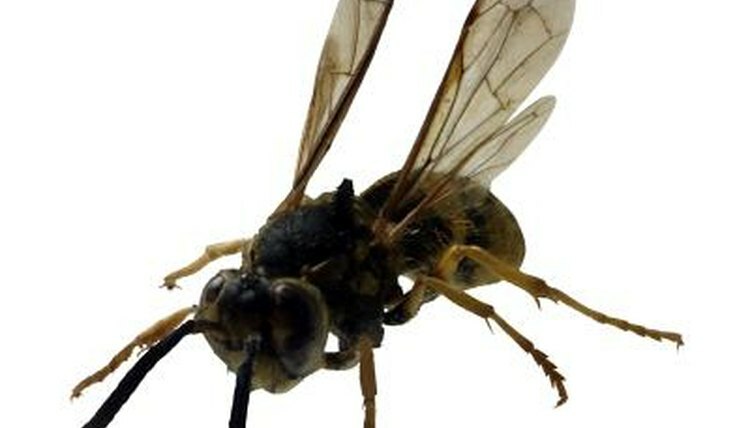 What Animals Attack Yellow Jacket Nests in the Ground? Yellow jackets can ruin an otherwise idyllic summer day as they buzz menacingly around pools, picnics and other outdoor areas frequented by humans. Living in concealed underground colonies, you may first be aware of their presence when your lawnmower runs over the nest, disturbing its 5,000 or so residents who are each capable of delivering multiple painful stings. Some species of wildlife are undaunted by stingers and find yellow jackets a tasty treat worth digging for. Yellow jackets prefer underground nests, sometimes moving into an abandoned animal or snake burrow. They also will nest in hollow logs, hollow walls or other easily accessible cavities, as well as protected areas such as under bushes or in tall grass. The yellow jackets construct an underground paper nest approximately the size of a soccer ball where young are nurtured to adulthood with a paste of insect protein. Adults feed on flower nectar. Among large mammals in the United States, bears are the most likely to consistently feed on yellow jackets. Insects provide a large portion of a black bear's diet, and a yellow jacket nest provides a convenient and nutritious meal. A bear's thick coat protects it from angry swarming adults while the bear slurps up nymphs and larvae out of the nest. If you encounter bear dung when you are out on a hike and poke it apart with a stick, it is not unusual to find exoskeletons of yellow jackets that have been passed through the bear's system undigested. While raccoons and skunks are not usually animals you care to have wandering around your property, they can be beneficial when it comes to routing out nests of yellow jackets. Like bears, skunks gain a large percentage of their dietary protein from insects and are one of the yellow jacket's main predators. Depending where you live, moles, shrews and badgers will also consume yellow jackets in their nests. In the southern states, armadillos have sharp digging claws, long burrowing noses and natural armor that equips them to eat yellow jackets. Hornets, including yellow jackets, retire inside their colony at night, making it an ideal time for bears, skunks, badgers and raccoons to pay them a call. You can set out an "all you can eat buffet" sign of sorts by pouring some honey on the entrance to the yellow jacket's nest at night. A keen nose and insatiable sweet tooth will direct a nearby animal to quickly hone in on the honey and the high-protein meal within the nest.